Well, the Celtics certainly didn’t get off to the start we had all hoped for, but on a brighter note our arch nemesis, the Los Angeles Lakers, are on the same page and find themselves at the bottom of the Pacific division standings. To make matters worse for L-A, one of the marquee players they brought in during the off-season, point guard Steve Nash, was injured in their recent loss to the Portland Trailblazers. The 38-year-old Nash collided with Portland Trailblazers rookie point guard Damian Lillard in the 2nd quarter of Wednesday nights 116 to 106 loss. Nash suffered a lower left leg contusion and was only able to play one series of the second half before being sent to the sidelines for the rest of the night. Nash was quoted on ESPN.com saying “I guess I wouldn’t want to say right now, but I’m definitely hopeful” on whether he’ll be game ready for this Fridays contest against the Los Angeles Clippers. While Laker Nation should by no means hit the panic button this early in the season, it certainly brings up two main question to consider. 1. 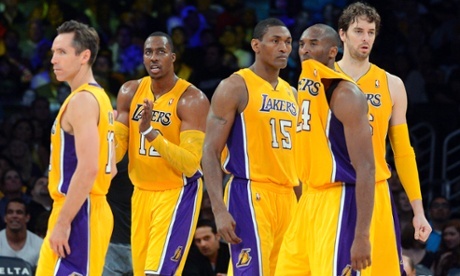 Can the Lakers keep everybody (especially Nash) healthy? Of the Lakers starting five, only Dwight Howard (26-years-old) is under the age of 30. Kobe Bryant (34), Metta World Peace (32), and Pau Gasol (32) are all above 30 years-of-age (including the aforementioned Nash, 38). Age could play a key role in whether this L-A squad can keep everyone out on the floor and not sidelined with injuries.This will also factor in to how many wins and losses the team will produce and whether or not a post-season will be in the picture. 2. Can this Lakers offense, filled with so many different personalities, actually co-exist? When you put this year’s Los Angeles Lakers team under a sports micro-scope, you’ll see a breeding ground for one of two contagious diseases. The first is success. 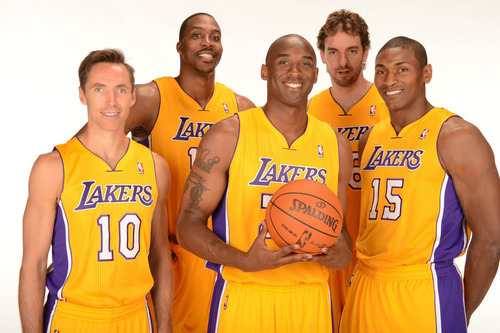 This Lakers squad is no doubt loaded with talent. If they can build a solid team chemistry, they could find themselves edging out the likes of the Oklahoma City Thunder and the San Antonio Spurs for a trip to the NBA Finals when it’s all said and done. However, the second is more deadly and could lead to the Lakers demise…failure. 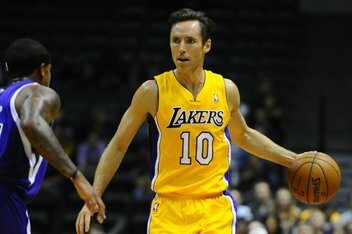 Can Steve Nash facilitate the rock and Kobe still get his shine? Will Dwight Howard be too big of a distraction on and off the court? Will Metta World Peace stay sane long enough to actually help the team this season? Is Pau Gasol still happy to be playing in the purple and gold after numerous trade talks swarmed his psyche last year? Alright so that was obviously more than two questions, but the 2012-2013 Lakers have a lot of question marks and sadly there is no clear answer to any of them just yet. We will simply have to wait, watch and wonder what will become of L-A this season. Until then, let us rejoice in their recent shortcomings. The C’s might be 0-1, but it beats 0-2 and are guys are healthy. This entry was posted in Celtics, Everything Else and tagged celtics, Damian Lillard, dwight howard, Kobe Bryant, Los Angeles Lakers, metta world peace, nba, NBA Finals, oklahoma city thunder, Pau Gasol, Portland Trailblazers, San Antonio Spurs, Steve Nash by tsmithbsb29. Bookmark the permalink.